Geography is offered at Junior and Leaving Certificate levels. The sections covered at Junior Certificate include physical, social and economic geography. Maps and photographs are also studied where students learn how to interpret and extrapolate information. At Leaving Certificate Level students study physical, regional and economic geography. We also cover Geo-ecology as part of the options section for honours students. Sixth year students also undertake a fieldwork study as part of their exam. This submitted study as part of their exam. This submitted study represents 20% of the overall Geography mark. 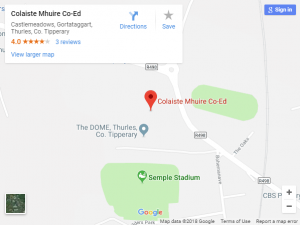 Students enjoy an atmosphere conducive to learning at Coláiste Mhuire Co-Ed class sizes are small and students are encouraged to aspire towards honours geography at both junior and leaving cert levels.